Last Wednesday’s violent disruption by a small contingent of Black Bloc anarchists after Oakland’s successful General Strike ended has brought to the forefront the role of vandalism and property damage in this otherwise-peaceful movement. 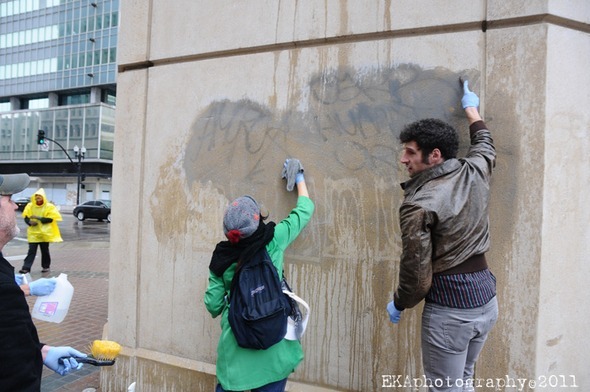 While aerosol writing has been an important tool in people’s uprisings for decades, the latest attack was simply a misguided destructive action by graffiti vandals. Aerosol writers have always a strong political awareness—from “Free-Huey” statements in the ‘60s to Bay Area writers who embraced the anti-apartheid movement and created a counter-narrative to the 500th anniversary of Christopher Colombus in the late 80s and early 90s. 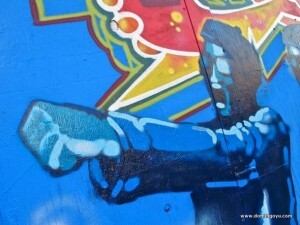 However, a recent trend in graffiti has been a demographic shift toward more affluent white people tagging in inner-city communities historically-populated by people of color. This was brought to CRP’s attention repeatedly during a recent mural project in West Oakland’s Ghosttown neighborhood, when neighborhood residents complained of taggers contributing to urban blight. This issue is mirrored by the actions of Black Bloc anarchists in both the Occupy Oakland protests and the Oscar Grant uprisings which began in 2009. In both cases, a small group of mostly-white, non-Oakland residents were responsible for much of the property damage and violence which marred otherwise-peaceful protests. Like the new generation of graffiti hipsters, the Black Bloc’s actions have been counterproductive, putting peaceful protestors, including women and children, at unnecessary risk. Adding further insult, their work is equally inarticulate. The majority of the graffiti produced in the downtown protest Wednesday night had no socially-redeeming message at all. Unlike the “I Am Oscar Grant” credo which emerged two years ago, much of the graffiti painted in downtown Oakland on Wednesday night was simply the artists’ names and the names of their friends with barely any political statements, other than advocating destruction. 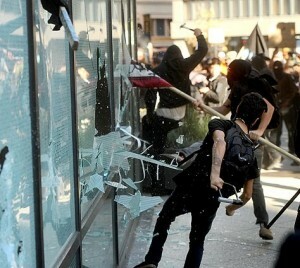 Black Bloc anarchists played into the mainstream media’s depiction of protestors being dangerous and unruly. For CRP as well as many in the community we live and work in, this is entirely unacceptable. It is a co-option of an artform which can and should be used in a constructive manner to uplift the 99%, not to detract from the ideals embraced by tens of thousands of peaceful protestors who participated in the general strike and the march on the Port of Oakland during the day on Wednesday. 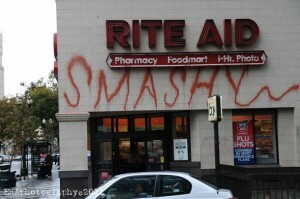 While aerosol culture has often occupied public space, sometimes illegally, there is an unwritten rule against “blowing up the spot.” People that make the area unsafe for other writers and/or draw the police to them are generally ostracized and considered “toys.” The Black Bloc anarchist taggers fall into this category. They are more than a nuisance; they are a threat. Their activities parallel the role of the police’s own agent provocateurs, because their behavior justifies police brutality, endangers innocents, causes mass arrests which debilitate the movement, and negatively impacts public perception. Careless tagging attracts Oakland police, who are notoriously brutal and out-of-control. This man was injured by out of control police responding the Black Bloc’s attempt derailing of an otherwise peaceful protest. In contrast, the work that the Community Rejuvenation Project does transforms the role of the aerosol writer from a local neighborhood scourge to a public servant. We utilize aerosol writing with imagery reflective on the community, nature, and the world that we want to see. 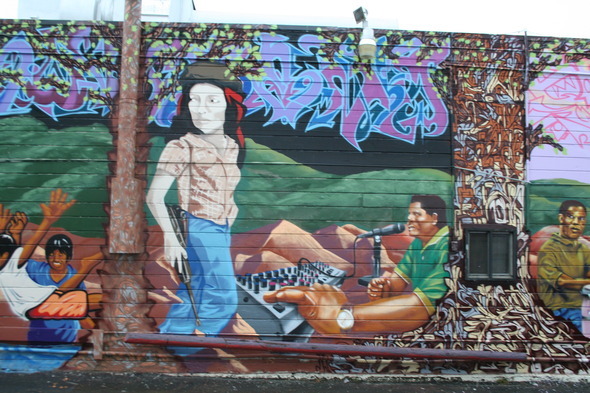 Murals become a tool against blight while training youth as artists and civic leaders. 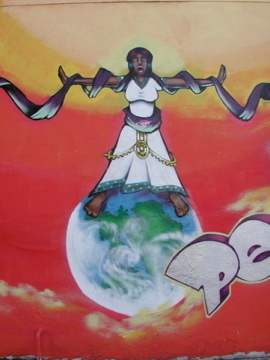 Grounded in the revolutionary values of the original aerosol writers, CRP incorporates traditional symbolism and healthy images that support the holistic development of communities. CRP is adamantly opposed to the use of the term “Occupy” but supports the Liberation and Decolonization of Oakland. We have concerns about the current movement’s actual ability to benefit the communities that we serve in East and West Oakland, i.e. the real 99% that has been consistently negatively impacted by the financial and social inequalities systems long before the housing bubbles burst. For this movement to make real change, the struggle must address social and racial issues beyond the economic ones. CRP supports the movement for government reparations to the descendants of African slaves and the honoring of all treaties made with indigenous peoples. We support the community takeover of the public’s visual space and we reject the notion that private property owners should be sole decision makers of what we look at. We believe that the current abatement standards are disjointed and incomplete and support a more holistic, community-based approach that involves local gardens producing healthy food, block parties connecting neighborhoods together, and creating lasting monuments that help define the area based on its history and its residents while creating a sense of positive self-identity. There are plenty of ways to spray your message with integrity without putting our community at risk needlessly. We understand the historical role graffiti and aerosol writing has had in populist uprisings and movements for social and economic justice. But we cannot condone frivolous and haphazard destruction that places our marches, our encampments and our communities at unnecessary risk. Too much is already at stake. or call us at (510) 269-7840.